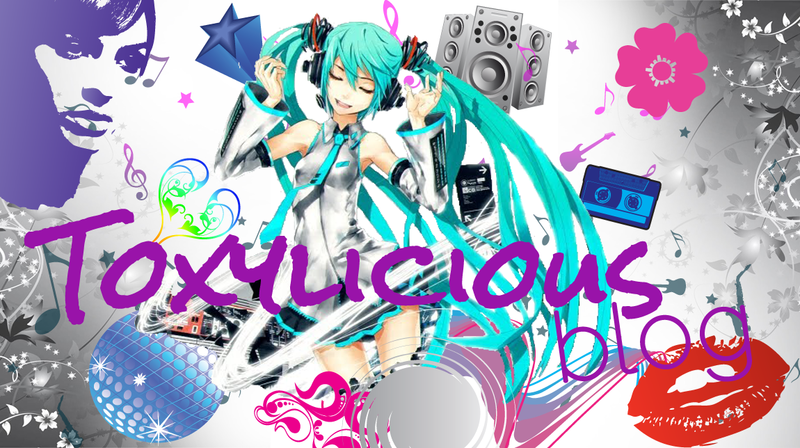 Now i came across the brand the other day whilst searching the net. Having never heard of them before i was curious to grab a few samples and try them out. They offer free sample on their website if you purchase their full price stuff, however you can order 4 samples...and just pay £3.00..so i thought why not...let give them a try. 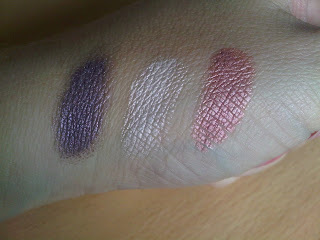 So i went for 2 eye shadows, 1 blusher and one of their Mineral veil samples (will explain later). 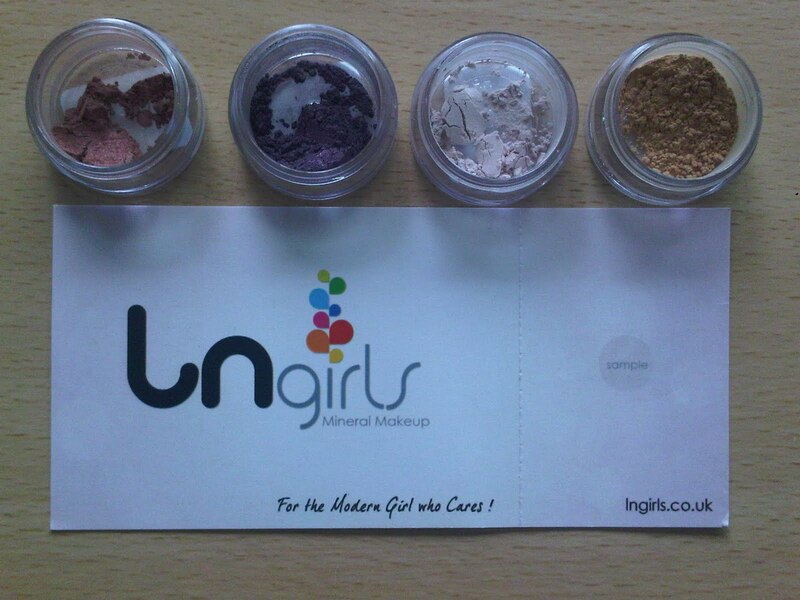 From left to right you have Blusher in Sugar Palace, Drama Queen eyeshadow, Agent X eye shadow and mineral veil Matt Glow. There wasn't a huge amount in each pot but i suppose a sample is what it says. 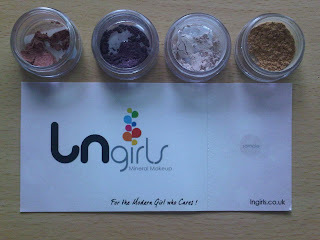 So firstly what is LN Girls all about, well their ethos is 'Organic Mineral make up for the girl who cares'. Their products are made from 100% pure natural ingredients with no 'nasties' as they call them such as talc's, dyes, fillers, animal by products etc. So onto the samples themselves. 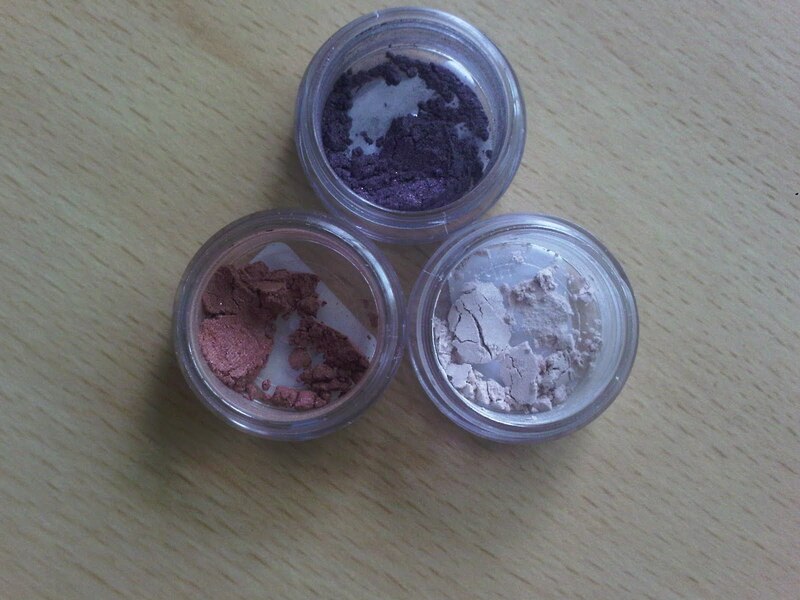 Firstly the eye shadows, the purple Drama Queen and the pale and iridescent Agent x. I found them quite difficult to apply being in a powder format....meant alot of colour fell on my cheeks which was a bit of a mare so you have to take your time applying. They don't blend in very easily either and i found my eye looked quite patchy in places so took a while to get an even covering.You can vary the intensity of the colour by applying more of the powder on top to give it a much deeper colour. They also do have a nice iridescent sheen to them. I did find that the blusher was much easier to apply..and again you can layer to increase intensity...gives a lovely subtle sheen & tone to your cheeks. So onto the mineral veil.....id describe is as a sort of imperfection concealer....they say it absorbs oil and reduces shine, hides spots and evens skin tone. It comes in 2 shades Glam Glow and Matt Glow which is the one i was sent. Application wasn't easy coming from such a small pot. Have to say i had blending issues again....but once on it gives a nice subtle sheen which you could essentially use as a highlighter. As for blending and covering imperfections i have to say iv used better and at RRP £16.90 i really don't think this is worth the high price they are selling it for.